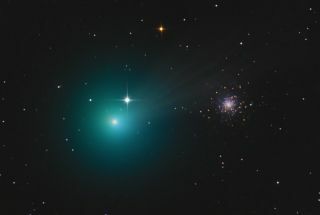 The bright green Comet Lovejoy (C/2014 Q2) is wowing stargazers in telescope and binocular views this week. Astrophotographer Chris Schur captured this view of Comet Lovejoy on Dec. 28, 2014 from Payson, Arizona. Located due south around 8 p.m. your local time this week, Eridanus, is actually fun to trace out. Begin at Orion, where the star Cursa is located to the north and west (upper right) of the brilliant blue star Rigel in Orion. This chart shows how to spot Comet Lovejoy in mid-January 2015, looking southeast at about 8 p.m. local time. Looking to the upper right of constellation Orion will assist in locating Comet Lovejoy. Currently passing through the boundaries of Eridanus is a celestial interloper, Comet Lovejoy. The comet, discovered last August by Australian amateur astronomer Terry Lovejoy (his fifth comet to date), is putting on a show for those equipped with little more than good binoculars or a small telescope. Officially catalogued as C/2014 Q2, this object is now reaching the pinnacle of its brightness; it will be making its closest approach to Earth tonight (Jan. 7) at a distance of 43.6 million miles (70.2 million km). A detailed finder chart shows where to look for Comet Lovejoy during January 2015. The dates' tick marks indicate the position at 0:00 Universal Time (7 p.m. on the previous date Eastern Standard Time). As such, the comet is now dimly visible to the unaided eye. The coma, or head of the comet, appears 18 arc minutes wide, or three-fifths the apparent diameter of the moon, corresponding to 238,600 miles (383,900 km). Alan MacRobert, senior editor of Sky & Telescope magazine, says that before the bright moon became too objectionable, his 10x50 binoculars revealed Lovejoy to be a "biggish puffball, moderately concentrated toward its center." He was also able to perceive the comet's greenish tint. "And this was through moderate suburban light pollution." There is no question that the comet would have appeared much more impressive were it not for the moon. Now that moon is moving out of the evening sky (tonight it will rise about an hour after the end of astronomical twilight), there will be about an hour of dark sky to view Comet Lovejoy with no interference from moonlight. Each night that follows, moonrise will occur about an hour later than the previous night, meaning progressively longer intervals of darkness while the comet will continue to climb higher and closer toward a better position for early evening viewing. And Comet Lovejoy continues to run well ahead of even the most optimistic brightness forecasts. German amateur astronomer Andreas Kammerer has been analyzing the evolution of Comet Lovejoy ever since its discovery and has been struck by how well it has performed. The best, Kammerer predicts, is yet to come. "It is very astonishing that this comet shows a very steady increase with such a great activity parameter over many weeks," Kammerer explained. "If it should continue this evolution it will reach magnitude 4.0 in mid-January, with the coma measuring about 25 arc minutes." Noted comet expert John Bortle agrees: "This has to be the object with the most extreme photometric parameters I've ever observed when it comes to an intrinsically large comet. If only C/2014 Q2 approached much closer to the sun it might well have become the most brilliant comet in all of history!" Alas, Lovejoy will remain beyond the orbit of Earth, coming no closer than 119.9 million miles (193 million km) from the sun on Jan. 30. A detailed finder chart shows where to look for Comet Lovejoy during January 2015. Skywatchers can use this black-and-white version outside in dim light. The dates' tick marks indicate the position at 0:00 Universal Time (7 p.m. on the previous date Eastern Standard Time). After passing through the Eridanus constellation, Comet Lovejoy will cross over into Taurus the Bull by Friday (Jan. 9). The comet currently is racing against the background stars at about 3 degrees per day, so even a few minutes of watching with a telescope should reveal its shift relative to background field stars. 'The comet will then begin to slow in its course across the sky, reaching Aries the Ram by Jan. 17 and finally skirting the boundary of Perseus the Hero and Triangulum the Triangle during the final week of January. By then it will likely have faded to around 5th magnitude, but still should make for an interesting object in both binoculars and small telescopes. Editor's note: Have you captured an amazing photo of Comet Lovejoy? If so, let us know. You can send us any comet photos or night sky views for a possible story or gallery by submitting images and comments to managing editor Tariq Malik at: spacephotos@space.com.